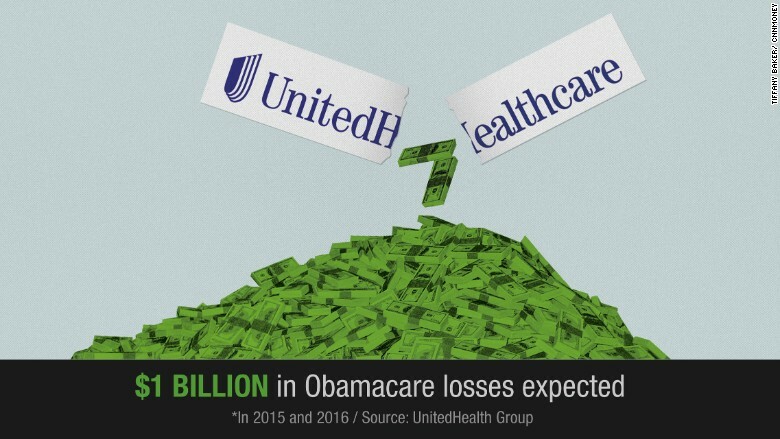 UnitedHealth expects to lose nearly $1 billion on Obamacare policies, the nation's largest insurer said Tuesday. UnitedHealth (UNH), which is weighing an exit from the Obamacare exchanges, reported it lost about $475 million on Obamacare-compliant plans in 2015 and expects to lose more than $500 million this year. Insurers have had mixed financial performances on the exchanges, but UnitedHealth is the largest insurer to say it may leave the program. Last week, Aetna CEO Mark Bertolini said at an investor's conference that it was too early to give up on Obamacare, though he noted his company lost "in the mid-single digits" on the exchanges in 2015. It expects to do better in 2016. While its Obamacare business weighed on UnitedHealth's fourth-quarter results, it still had a profitable year thanks to its other operations. The insurer earned $5.8 billion in 2015, up from $5.6 billion a year earlier.